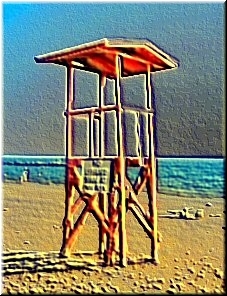 Fanciful Florida: The lifeguard tower reconsidered. 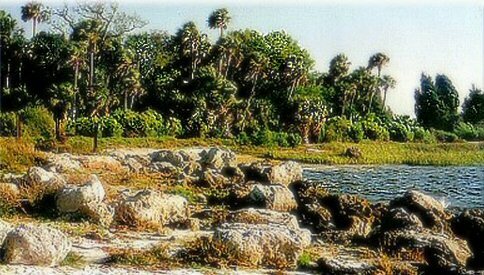 I love this picture---the original is in my Nature Coast photographs---and I thought I'd have a go at a different treatment. 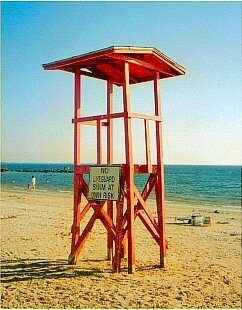 It's the lifeguard tower at Fort Island Gulf Beach in Citrus County. 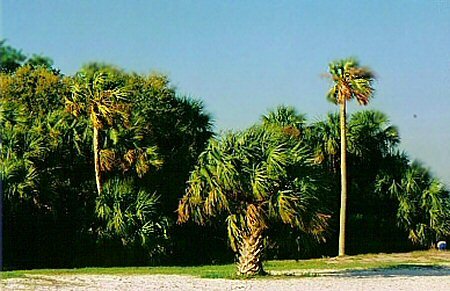 For photographs of Fort Island Gulf Beach, click here and scroll down! 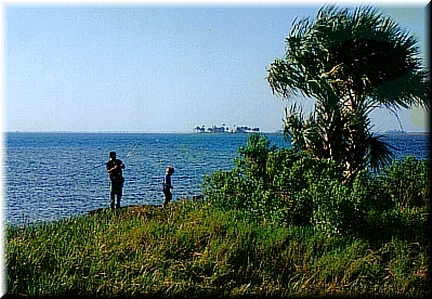 This is another view of Fort Island Gulf Beach. 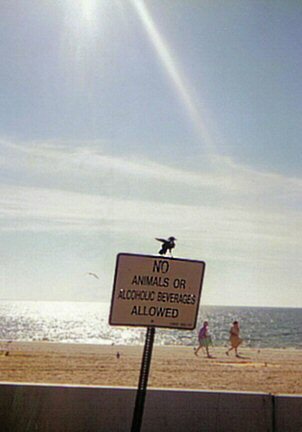 This bird obviously isn't a gull---I don't know what he is---but he obviously hasn't read the sign. He was the only non-gull I saw that day, but doesn't he look very triumphant with that sunbeam shining down on him overhead? Hundreds of gulls were whirling around, snatching french fries from people's hands. He was just standing on this sign flapping his wings and squawking. It's so easy for me to believe when I look at this photo that birds are descended from the dinosaurs. 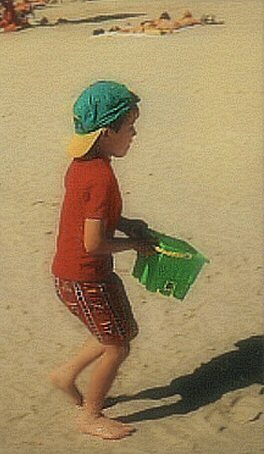 I am particularly fond of this photo of a little boy---my stepson, actually---which I took at Fort Island Gulf Beach almost 9 years ago. I love the earnest, dedicated expression on his face and the combination of the primary colors in his shorts and shirt with the green bucket and blue-green hat. 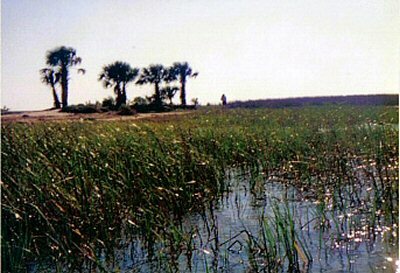 It was one of my late husband's favorite photos. 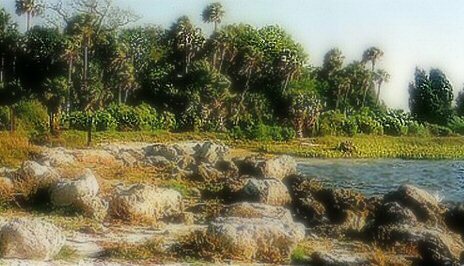 This particular long-ago little Floridian (he is in his teens now) was having a wonderful time scooping up water from the gulf and using it to make a moat around the sand castle he was constructing with his sister. He stumbled into the foreground of a landscape photograph I hadn't intended anyone to occupy, but in the end turned out to be the one thing that made the photo worth keeping. I don't usually take photographs for general display with people in them (at least, not intentionally) but sometimes they turn up in the photo and end up being the main interest. Because this is really just a detail from a larger photo, the quality ain't great, even by my amateur's standards. Never mind; as in so much else in life, it's the thought that counts!